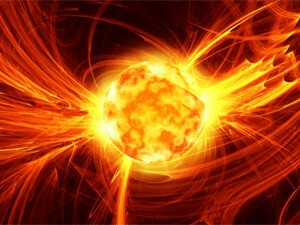 SA's space agency says it expects major disruptions from the latest solar flare activity. SA may be in for a bout of communication interruptions due to a solar flare that has been travelling towards the sun-facing regions of the globe since Tuesday. This is according to the South African National Space Agency (SANSA) and comes as a geomagnetic storm - caused by an X-class X-ray solar flare, accompanied by a coronal mass ejection (CME) - heads our way. A CME is a massive cloud of high-energy particles ejected from the surface of the sun when stored energy is suddenly released. When the magnetic field of a CME interacts with Earth's magnetic field, it causes a temporary disturbance - known as a geomagnetic storm. According to SANSA, the CME impacted Earth's magnetic field at around 11am (GMT+2/SA time) on Thursday. The space agency says the impact could spark a strong geomagnetic storm that may last throughout 10 January - and perhaps beyond. SANSA said yesterday: "The geomagnetic storm has not yet started and may last for more than a day when it occurs." The impact of the CME, says SANSA, will not harm humans or other life forms on Earth - "as we are protected by the Earth's magnetic field". However, the agency says it can cause "disturbances" to SA's satellite communication systems. This includes global positioning systems (GPS), radio communications, Internet, cellphones and DStv. "Major disturbances are expected at this stage," says SANSA. The space agency says it will monitor the expected geomagnetic storm - a product of the CME, which it estimates is travelling at a speed of 2 353km per second (about 8.5 million kilometres per hour). When asked for clarification of "major disturbances", SANSA said a CME can cause major fluctuations in the ionosphere. "All radio signals from satellite communication systems have to pass through the ionosphere and can be disturbed if the ionosphere fluctuates. This includes all Internet access via satellites. The disturbance is likely to be of short duration and temporary." According to Wikipedia, "the ionosphere is a region of the upper atmosphere, from about 85km to 600km altitude, and includes the thermosphere and parts of the mesosphere and exosphere. It has practical importance because, among other functions, it influences radio propagation to distant places on Earth". SANSA says cellphones may be affected if there are power disturbances following the arrival of a CME due to repeater stations being affected by power fluctuations. Vodacom spokesperson Richard Boorman says: "[There has been] no impact. The only real way it could impact mobile communications, other than if the electricity grid goes down, is if it took out the GPS satellites. If that happened, it could affect the synchronisation of base stations." SANSA says the previous solar flare, which occurred about two-and-a-half months ago, had more of an impact on SA's communications than the current occurrence thus far. The full extent of the current solar flare still remains to be seen, says SANSA. "The geomagnetic storm has not yet started and may last for more than a day when it occurs." International reports say the latest solar flare delayed the planned US launch of a private cargo ship to the International Space Station on Wednesday, due to concerns over space weather radiation. According to Space.com: "The first major solar flare of 2014 erupted from a massive sunspot seven times the size of Earth on Tuesday after a series of mid-level sun storms in recent days. The event occurred as the commercial spaceflight company Orbital Sciences was preparing to launch a landmark cargo delivery flight to the space station today with its Antares rocket and robotic Cygnus spacecraft." The tech site cites Orbital's CTO as saying the corporation was concerned about mission failure. "The company is evaluating the extent of Tuesday's flare and the potential for solar radiation to interfere with critical systems like gyroscopes and avionics." Reuters confirms the unmanned rocket finally blasted off to deliver the first of eight cargo ships to the International Space Station for NASA yesterday. "The 13-storey rocket lifted off its seaside launch pad on Wallops Island, Virginia, at 1:07 pm EST/18:07 GMT, putting the Cygnus freighter on track for an early Sunday rendezvous with the station."